There seems to be a growing trend in lifestyles for people that live on the mantra that ‘less is more’ or as one might call a minimalist lifestyle. I’ve been reading up on Tiny Houses and learning how these people got out of living the “Big American Dream” of owning everything and downsizing to just the basic essentials to live a happier life. I remember my past post on cleaning out the closet and after learning more about minimalism I’ve realized there’s more than my closet I need to clean out to reach happiness. Most Americans are taught at an early age to study, work hard, get a good education, get a good paying job, get married, buy your dream house, and start a family (not particularly all in that order) to obtain happiness. In addition, the status of success is symoblized by a big roomy house equipped with all the latest gadgets and accessories to make life “easier”. The house should also have a garage that has the latest fancy name brand vehicles in it. Having all of this stuff is the sign of success according to the ideal American Dream, or is it? If you search the internet for the Tiny House Movement or look up minimalism you will discover that some people have went the opposite of the typical American ideal and have found happiness, debt free and less items. These people have purged their lives of all material things that have been defined as excessive and just not necesary. Those extra shoes are paired down to just two or three pairs. Those books are converted to e-readers to save space because these minimalists have even downsized their living quarters to just a little less than 100 square feet. No, that is not a typo, some of these tiny house pioneers dwell in a living space a shy less of one hundred square footage. That is about the size of my downstairs bathroom! It may seem startling to find that anyone can be happy existing in such a small space but people are doing it and even families with children are doing it and they all appear to be happy with their little nook they call home. The benefits these minimalists boast when discussing their lifestyle includes a mortgage free life, more time for each other, and a better perspective on what really matters in life. One tiny house pioneer boasted a utiity bill of just $8 a month while another said she enjoyed owning a home debt free since she did not have to worry about paying a mortgage for the next 30 years like most homeowners. One family discussed how having less electronics forced them to spend more time together and are much happier without being bogged down by the electronics. Another tiny home dweller discussed how having a lot of stuff gets in the way of what life is really about and if they do buy an item then they stick to the rule that another item must be thrown out or given away. Dee Williams, one of the first tiny house pioneers says she doesn’t miss owning a 2000 square foot home and is more content with her much smaller house of 89 square feet. Dee also adds that “having no mortgage or utility bills is like finding freedom” and “there are things you hold inside of you…that have a lot more meaning than a photo or something in writing”. 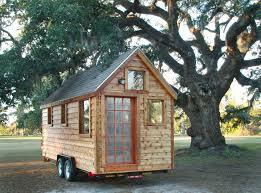 After researching the tiny house movement I looked at ways I can minimize my life. While I can’t sell my spouse on the idea of shifting our lifestyle to a tiny house I can still downsize my life in some way. This means going through my shoe supply (yes, it’s that many) to the most worn pairs. I can also go through my wardrobe to see what I haven’t worn in over a year and give to good will. I can also refrain from getting the latest “must have gadget” and just be happy with what I already have, which can help minimize my credit debt. I can also go through each room in my house to evaluate what I really absolutely need. Afterall, would it really kill the room if I had one less vase in it or do I really need all of those books? The minimalist movement is a growing trend which is being made possible by the tiny house movement. These minimalists are realizing that the American dream doesn’t have to have the big roomy house, the shiny fancy cars, or a closet full of designer clothes. The American dream can be all about having just what you need and living within your means to appreciate what you already have. In the end, less is more. Gallery | This entry was posted in Be the Change Lifestyle and tagged Clean, Clutter, dreams, Happiness, house, less, more, sanctuary, success, tiny, value. Bookmark the permalink. I bumped into a quote today, “He has the most who is most content with the least” by Diogenes, which reminded me of this post of yours; not “of you”, because I am not forgetting you. You are always in my heart and mind, and I hope you are predominantly happily busy with your journey. So good to hear from you. I’ve been super busy and have had no time for writing here. I plan on getting back soon. Thanks for thinking of me. I hope life is treating you well. Life is a divine gift; it is others who are making it hell for us here in Greece. I never stop believing, and I am forever grateful to you for helping me in this. Do not worry if writing here cannot be your priority. Just keep on spreading light in our world and know that I always pray for you to feel cherished by everyone whose lives you touch. You matter, precious Sister. My wife and I have built a tiny house on an island. Our main living space is nine by twelve feet, with a loft above for sleeping. We have no electricity, or running water. It is perfect. Namaste, Dennis. That’s awesome! Thanks for sharing. I bet life is much more simpler for you and your wife since it’s not bogged down by unneeded stuff life the rest of us collect. Thanks for stopping by and reading here.